From 4-7th September 2016 the WildCRU, together with Panthera was inspired by the calibre of discussion of lion conservation by the 58 participants we hosted at the Cecil Summit. This was the first step in what is planned to be an unfolding and evolving series of meetings. After three days, the final session was held in public, and included statements from the Chief of the Africa Office of UNESCO, contributions from the recent head of UNEP, almost two hours of insightful engagement with Rory Stewart, Minister for International Development, along with the discussions of an exceptionally talented and experienced panel chaired by Alan Rusbridger, former editor of the Guardian and now Principal of Lady Margaret Hall. This discussion followed a presentation by Professor David Macdonald who, together with Dr Dawn Burnham, had organised the Summit, and summarised the plight of lions and the insights of the Summiteers – the public session can be seen on: https://www.youtube.com/watch?v=sWCxTDkLho0 and further discussions, including engagement with four specialists from the African Lion Working Group at the Oxford Martin School can be seen at https://www.youtube.com/watch?v=m8q82xQeQWE. Although the Cecil Summit focused on lions, it did so in the conviction that they are a metaphor for wider biodiversity conservation, and that lions serve as both umbrellas and ambassadors for African wildlife more generally. Between 4-7th September 2016, at Oxford University’s Wildlife Conservation Research Unit’s centre in Tubney Village, 58 delegates met to seek innovative solutions to conserving African lions in response to a widespread collapse in their numbers and distribution in the wild. Global public attention had been drawn to this issue in July 2015 by the allegedly illegal trophy hunting of Cecil, a lion satellite-tracked by WildCRU since 2008, and so this brainstorming meeting was called the Cecil Summit. The delegates, hosted by WildCRU and Panthera, the global cat conservation organisation, composed of 30 experts in diverse aspects lion conservation who were confronted with new ideas from 28 international experts in economics, political science, development, ethics, communications and other disciplines that may hold the key answers to the question of how to halt and reverse the decline in wild lions. In addition, four international lion experts, members of the African Lion Working Group, skyped in contributions from Mozambique, South Africa, Zambia and Zimbabwe, and the Director general of Zimbabwe National Parks also skyped in, while the Chief of the Africa Office of UNESCO contributed a video message. Against the background of major advances in techniques for the local hands-on protection of lions, the Summit focused instead on wider horizons across the socio-economic and political landscape. Although crossing disciplinary borders is a well-established goal, the format of this meeting, not merely favouring, but forcing extreme inter-disciplinarity, sets a precedent for conservation and might, in the tradition of naming diplomatic mechanisms after their initial venues, be termed the ‘Tubney Format’. Also critical to this format was the engagement of stakeholders from lion range states in Africa, and attention to the communities living alongside these inspiring, charismatic, ecologically important but also dangerous carnivores: the Summit therefore represented the first step of a conversation, catalysed between inter-disciplinary innovative thinkers and local and global stakeholders. Overall, the Summit recognized that while ensuring that the financial value of lions was maximized to make it desirable for communities and nations to live with them, the conservation of lions will not succeed if the motivation for it relies solely on their direct financial value, or even wider ecosystem services provided by the large, wild landscapes on which lions rely. Rather that motivation must come also from the value given to their existence and thus a commitment to pay for their survival. While many people who do not live with lions may already view their conservation as a moral imperative, some who live with lions and bear the costs of doing so have understandably different perspectives. To ensure that lion conservation is truly an international moral imperative, a top priority is to ensure that local, national and global communities all value the existence of wild lions and regard their decline towards extinction as intolerable. With regard to financial mechanisms, the Cecil Summit recommended that one early step should be the establishment of a globally supported fund to advance lion conservation in Africa and in particular to underpin payments to encourage coexistence between local communities and lions. Such a fund should support both action and gaining knowledge and evidence to advance lion conservation. Participation should foster a portfolio of best practices, and should be viewed as an interim, catalyzing step towards the urgently required sums, likely to run into billions of dollars, necessary to sustain lion conservation in the long term. The protected area network that occurs within lion range is large enough to house many more lions than the current continental total, if sufficient resources and expertise were available for the management of those areas. Within lion range, there are a number of key lion landscapes, or ‘Lionscapes’ (containing mosaics of protected and unprotected lands), which if secured, would effectively guarantee the survival of lions, elephants and several other key species. The Cecil Summit recommends securing and restoring populations in key lion units to ensure they provide lasting and real ecological, economic and social values across their African landscapes in perpetuity. Lions often impose significant costs on local communities and, regardless of wider benefits (e.g. GDP from tourism and global existence values), do not always generate sufficient local benefits to offset those costs, leading to loss of lions and their ecosystems. The Cecil Summit recommends creating mechanisms for mutually beneficial coexistence of healthy lion populations with healthy human populations across the lionscapes with the goal of increasing the pride of local people in their lions and establishing fairness in conservation practices so that the costs do not fall on the shoulders of those least able to bear them. It is urgent to increase global interest in lion conservation and use that interest to mobilize resources. The Cecil Summit recommends broadening the constituency for lion conservation by raising awareness and concern among new audiences in the global arena. A particular goal should be shifting the development and economic priority to sustaining life supporting ecosystems. Increasing the demand for lion conservation requires understanding the many values and interests of these different stakeholders while finding fundamental shared values connecting lion preservation with larger ecological and social concerns. Some of the world’s poorest people currently find themselves paying for a global good demanded by the world’s richest people. How can everybody around the world who desires lion conservation share in that cost? The Cecil Summit recommends harnessing members of the global community with the greatest interest and financial resources to support conservation in lion range states. Lions in the wild are an important part of our common global heritage – in different ways we all benefit from having lions, and the ecosystems and landscapes they represent. However, the fact is that this global benefit is being financed largely by the poorest countries in the world, and sometimes by the poorest people in those countries. Any fair solution to halting the loss of lions and lion habitat must increase benefits for the people most directly affected – African villagers living with wildlife. It should also provide much-needed finance for the authorities that manage protected areas in Africa. The Cecil Summit recommends accelerating the governmental and multi-national engines of financial support required to assist African nations to save the lion. The Cecil Summit was originally conceived as an evolving series of meetings, beginning with this brainstorming session. The delegates resolved to advance five headline issues in subsequent Cecil Summits, refining ideas for breaking the mould of lion conservation, continuing ever-greater engagement with range-state authorities, ideally culminating in high level meetings of the leaders of the African nations and communities within the lion’s geographic range. 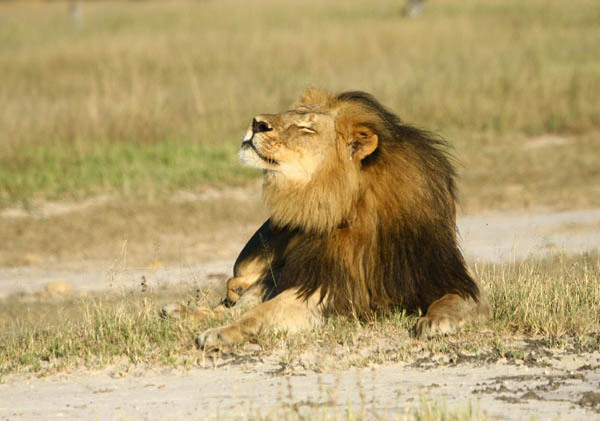 We began this journey when the Cecil Moment grabbed the world’s attention. The Cecil Summit has given that moment momentum towards enabling the Cecil Movement to deliver the conservation of lions, and the wider biodiversity for which lions are ambassadors. To achieve this we need global support. Leandro Abade (WildCRU), Laila Bahaa el din (WildCRU), Hans Bauer (WildCRU), Dominic Bauer (WildCRU), Joanna Benn (The Nature Conservancy), Stephen Blakey (United for Wildlife), Maitseo Bolaane (University of Botswana), Urs Breitenmoser (IUCN), Dawn Burnham (WildCRU), Stefan Carpenter (Indiana University Bloomington), Guillaume Chapron (Swedish University of Agricultural Sciences), Peter Coals (WildCRU), Alayne Cotterill (WildCRU), Sam Cushman (WildCRU), Richard Damania (World Bank), Amy Dickman (WildCRU), Byron du Preez (WildCRU), Genevieve Finerty (WildCRU), Anke Fischer (James Hutton Institute), Paul Funston (Panthera), Robert Hahn (Smith School of Enterprise and the Environment), Kirk Hamilton (Grantham Institute on Climate Change and the Environment), Nick Hanley (University of St Andrews), Sarah Harper (Institute of Population Ageing), Amy Hinks (WildCRU), Luke Hunter (Panthera), Kim Jacobsen (WildCRU), David Johns (Hatfield School of Government), Dom Johnson (International Relations, University of Oxford), Paul Johnson (WildCRU), John Kamanga (Southern Rift Association of Land Owners), Kristina Kesch (WildCRU), David Konisky (SPEA, Indiana University Bloomington), Peter Lindsey (Panthera), Andrew Loveridge (WildCRU), Harrunah Lyimo (University of Minnesota), David Macdonald (WildCRU), Ewan Macdonald (WildCRU), Edmond Moukala (UNESCO (by video)), Godfrey Mtare (Zimbabwe National Parks (by Skype)), Liomba-Junior Mathe (WildCRU), Frank Matose (University of Cape Town), Fred (Fritz) Mayer (Sanford School of Public Policy ), Joseph Mbaiwa (University of Botswana), Moreangels Mbizah (WildCRU), E.J. Milner-Gulland (ICCS, University of Oxford), Susana Mourato (Department of Geography and Environment, LSE), Wilson Mutinhima (Zimbabwe National Parks (by Skype)), Craig Packer (University of Minnesota), Jefe Parrish (WCN), Lisanne Petracca (WildCRU/Panthera), Dilys Roe (International Institute for Environment and Development), Chris Sandbrook (UNEP-WCMC), Lovemore Sibanda (WildCRU), Claudio Sillero (WildCRU), Achim Steiner (Oxford Martin School), Susie Watts (WILDAID), Guy Western (WildCRU), Viv Williams (WildCRU), Nobby Yamaguchi (Qatar University). In addition, Matt Becker (Zambia Carnivore Programme), Colleen Begg (Niassa Carnivore Project), Godfrey Mtare (Zimbabwe National Parks) and Sam Ferreira (SANParks) (members of the ALWG) made important skype contributions.